The controversy just keeps on keeping on when it comes to the fate of the former Burlington College land on North Avenue. Developer Eric Farrell purchased the 27 acres of forests and meadows earlier this year. At a meeting Tuesday night about potential development, members of Save Open Space Burlington complained repeatedly that the session's format was designed to squelch democracy. They tried unsuccessfully to hijack the proceedings to hold an open-mic, public forum-style discussion. Instead, the event, cosponsored by the city, started with a presentation. Then attendees broke up into smaller groups for discussions as planned, despite the vocal objections of several of the 100 or so people who gathered at the Sustainability Academy on North Street. "It's a pretense of democracy," said Charles Simpson, a Save Open Space member. Ruby Perry was also frustrated. "It's totally managed," she said. Breaking into small groups didn't allow people to hear each other and get "inspired to collective action," she said. July Sanders agreed. The format seemed designed to prevent critics of development from building any momentum or rising up as a group, Sanders said. The city needs to preserve accessible green space that people can walk to, Sanders said, adding: "It's what makes Burlington a great place to live." Jesse Bridges, director of Burlington Parks and Recreation, which helped run the event, insisted on keeping the small-group format and said it meant more people could contribute, including those who wouldn't be comfortable speaking to the entire room. "There's a process to this forum and how this forum is going to be run," he told the crowd, after critics repeatedly interrupted the proceedings. The meeting was sponsored by the city of Burlington, Farrell, the Vermont Land Trust and Champlain Housing Trust. They are working together to come up with a plan for the property that weighs affordable housing needs, conservation, and public access to land that has trails leading to Lake Champlain and community garden space. Boston consulting group Sasaki Associates helped run the meeting and will be paid up to $80,000 to help gather public input and to lead a public design process. City taxpayers will pay around $23,000 of the consultants' tab, with the rest paid for by Farrell, the Land Trust and Champlain Housing, which hopes to partner with Farrell on construction of affordable housing there. Farrell has made public plans to build about 60 apartments on a six-acre parcel that Burlington College retained, but has not filed for permits for that project yet. He has not said how many units of housing he might want to build on his 27 acres, nor has he filed any applications for the necessary city approvals or the required state land use permit under Act 250. The zoning would allow hundreds of units. Before the meeting, about 75 people took up an offer to tour the land as a late afternoon sun shone over the property. For much of the 20th century, it had hosted an orphanage run by the Roman Catholic Diocese of Burlington. The diocese sold the property to Burlington College, which hit financial trouble and then sold most of the land to Farrell. The college retained the 19th century orphanage building and a more recent addition to it. Farrell plans to buy the orphanage structure next year. 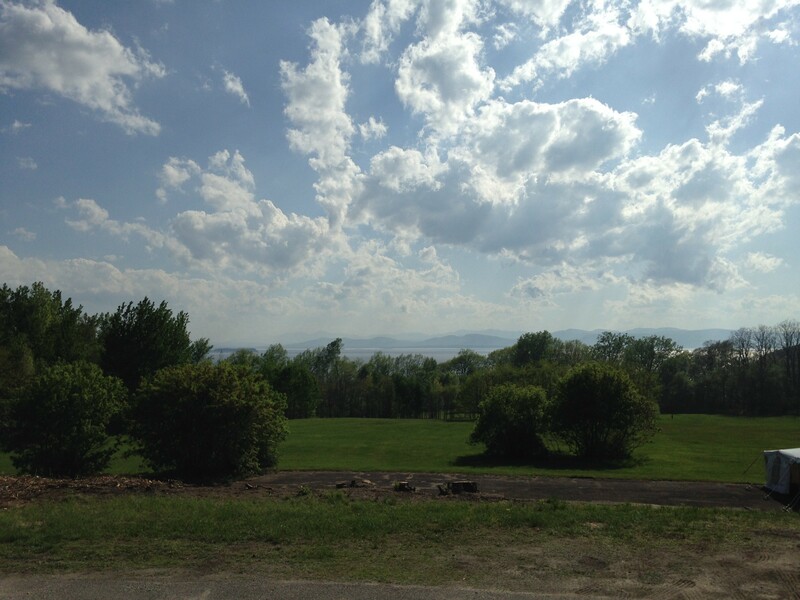 The property has a section of forest, open rolling meadow, steep banks leading down to the Burlington bike path and about 930 feet of shoreline on Lake Champlain. Coyotes, foxes, skunks and other animals roam the land, and pedestrians and cyclists follow the path down to the shoreline. Michael Monte, chief operating and financial officer for the Champlain Housing Trust, explained during the tour that homeless encampments are nestled in the woods around the property. There's a dire need for affordable housing in Burlington, and every month, Champlain Housing is forced to turn people away because of a shortage of units, Monte said. Some of the people on the tour agreed Burlington needs more affordable housing, but not on the former college land. "It's a monstrously large project proposed for a very beautiful area," said Martha Molpus, who lives in the North End and walks the property regularly. She'd like to see the land kept open. Farrell answered questions as they came up during the tour and said during a pause in the walk that he doesn't believe it would serve the community for the entire parcel to be preserved. The city needs housing, the property tax revenue it will bring and some measure of open space, he said. The current process of gathering input will help lead to a more balanced plan for the land than the normal public review, he suggested. "I could have just designed something and gone into the permit process," Farrell said. "That wouldn't have been a very inclusive approach, so we're doing what we're doing."